The CitEcar Transit Buddy line of vehicles are for those shuttle chores required around your Campus, Parking Lot, Town Center, Resort, or Facility. Some of these models may hold up to 28 passengers when our tag along trailer is purchased! With this option, a second bank of batteries can be installed within the trailer to increase travel distances greatly! On your CitecarTransit Buddy, we can add many options such as back up cameras, DVD Players, heaters, fans and even air conditioning when necessary! Smaller shuttles have a 48-volt system as a power source with a single battery charger. Our larger shuttles (12-28 Passenger Shuttles) contain two 48 volt systems for the longer range and quicker charging than a 72 volt "series" battery system. Our shuttles come standard with two chargers not one and each charger is responsible to charge only one bank of 48 volts of batteries. This decreases necessary charging time by half versus having one charger responsible for charging all batteries. Several models will qualify for the Low Speed Vehicle standards necessary to drive them on public roadways as well. Please consult a Moto Electric Salesperson for more specific details on this requirement. Our vehicles can travel an industry leading 50 miles per charge! It costs about one penny per mile traveled if you charge your vehicle overnight, when electric power is at its cheapest! Our built in on board chargers not only keep our batteries ready to go but contain a microprocessor so they will never overcharge. Once a full charge is detected, they simply turn themselves off! You will be able to "opportunity charge" your vehicle at anytime while on a break, shopping or simply at lunch because your charger will be contained right on the vehicle. Our Citecar Transit Buddy are perfect for any shuttle application that requires use of a vehicle at speeds of 25 miles per hour or less in a clean, quiet, smooth "classy" environmentally friendly setting. 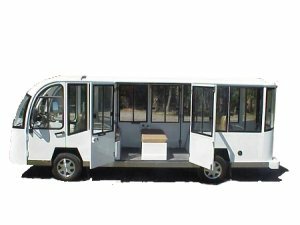 Our Transit Shuttle Vehicles come equipped with a 5Kw (6.7 Hp) upgraded motor but several other motor options are available. Gross Vehicle Weight: 3,500 Lbs.